Concentrations of Hg, Pb, Cd, and Cr in 240 shellfish including oyster, short-necked clam, razor clam, and mud clam collected from six administrative regions in Xiamen of China were measured. The daily intakes of heavy metals through the consumption of shellfish were estimated based on both of the metal concentrations in shellfish and the consuming amounts of shellfish. In addition, the target hazard quotients (THQ) were used to evaluate the potential risk of heavy metals in shellfish on human body. Results showed that the concentrations of heavy metals in shellfish ranged at the following sequence: Cr > Cd > Pb > Hg. The concentrations of Hg and Pb in most samples were below the limits (0.3 mg kg−1 for Hg and 0.5 mg kg−1 for Pb) of national standard (GB 18406.4-2001) set in China. About 57 % of samples were found to contain more than 0.1 mg kg−1 of Cd, in which the highest level was found in oyster from Xiangan with a value of 1.21 mg kg−1. The average concentrations of Cd in oyster and mud clam samples were 0.338 and 0.369 mg kg−1, respectively, which were significantly higher (p < 0.05) than those in the samples of short-necked clam and razor clam. The highest concentration of Cr was found to present in short-necked clam from Jimei with a value of 10.4 mg kg−1, but a mean value of 1.95 mg kg−1 in all the shellfish was observed, and no significant difference was found among the different sampling regions. The calculated daily intakes of Hg, Pb, Cd, and Cr through consuming the shellfish were 0.005, 0.122, 0.137, and 1.20 μg kg−1 day−1, respectively, which accounted for 2.19, 3.42, 13.7, and 40.1 % of the corresponding tolerable limits suggested by the Joint FAO/WHO Expert Committee on Food Additives. The THQ values of the four metals were far below 1 for most samples, except for those of Cd and Cr in the four shellfish species with the mean values of 0.132 and 0.385, respectively. The highest THQ values of Cd were observed in the species of oyster (0.719) and mud clam (0.568). But the high THQ values of Cr observed in all the four species were derived from the applied reference dose (RfD) data of Cr(VI) due to the unavailable RfD value of total Cr. 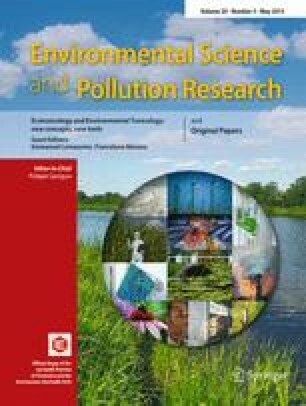 The results indicate that the intakes of heavy metals by consuming shellfish collected from Xiamen of China do not present an appreciable hazard risk on human health, but attention should be paid to consuming those with relatively high THQ values, such as oyster, mud clam, and short-necked clam. An erratum to this article can be found at http://dx.doi.org/10.1007/s11356-012-1248-7. The work was supported by grants from the National Natural Science Foundation of China (no. 40771185), the Natural Science Foundation of Fujian Province of China (2012J01046), the Science and Technology Planning Project of Fujian Province, China (2012Y0052), the Science and Technology Planning Project of Xiamen, China (3502Z20113024), the Foundation of the Key Project Laboratory of Urban Environment and Health, Institute of Urban Environment, Chinese Academy of Sciences (KLUEH201006), and the Foundation for Innovative Research Team of Jimei University (2010A007).